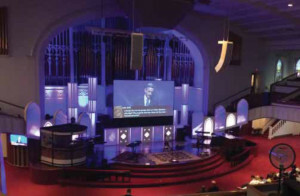 First Baptist Dallas is located in the heart of Downtown Dallas and has a rich history of Gospel-centered ministry and worship. Recently, we have undergone a major physical metamorphosis including the demolition of most of our buildings across two city blocks, leading to the construction of a new worship center, children and student building, 11 new venues, and worship and media office suites. In the Spring of 2013, when First Baptist Dallas moved into our newly expanded downtown campus, we also moved DayOne, our contemporary worship service, into a new venue. 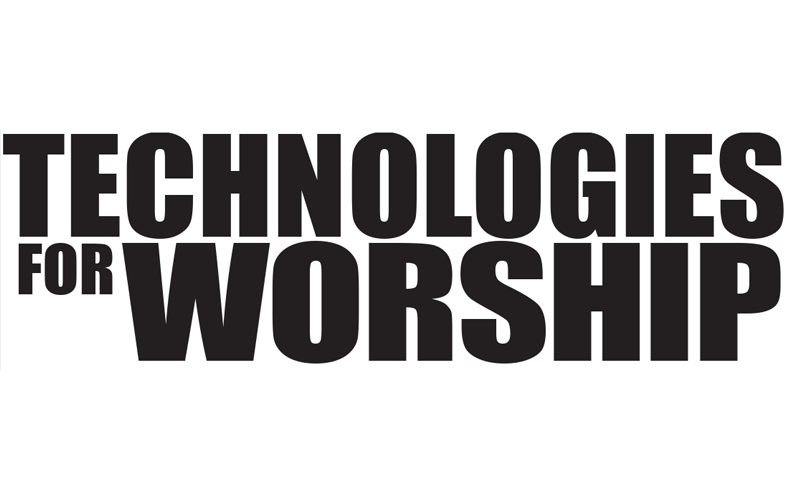 DayOne is led by a worship team of highly skilled musicians who work each week to create an atmosphere of worship for the congregants of First Dallas who prefer a more contemporary flare to their music. 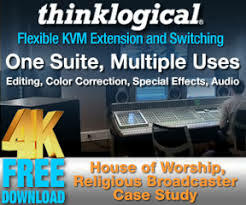 Dr. Robert Jeffress’ sermon is simulcast into the venue via fiber from the Master Control Room in the new building, and we use a Grass Valley T2 to time-slip the delivery. Having met in our 500-seat Truett Chapel for several years, we decided to move DayOne into the historic sanctuary that the other service was vacating. Contemporary worship held in such a vintage space would make for a very unique experience. However, this blending of old and new made for some interesting design challenges. Paragon360 helped us to build lighting, scenery, and audio systems that would allow a contemporary service to feel at home in a 126-yearold room. 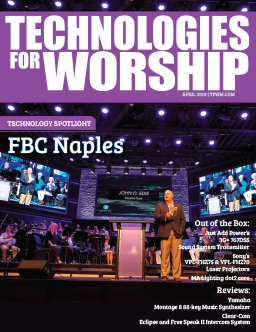 This included removing two side screens and installing a single screen close to stage level that would support lyrics, graphics, videos, and the simulcast sermon. An added complication to this room is the baptismal, which sits squarely in the middle of the upstage portion of the choir loft. We felt as though the center screen location was vital for a proper simulcast experience for the congregation, so we needed a screen that could retract any time we would do baptisms during the service. This meant it needed to be relatively fast and very quiet. Paragon360 recommended a product made by Vutec that came out after our initial installation. The Retracta-Vu Vision XR HD ascending video screen was a perfect solution for our room. The 108”x192” projection surface was significantly larger than our previous screen, and the motorized operation is surprisingly quiet. This is a front projection screen, but they also make rear projection versions. We control the screen using their low voltage relay control tied into our AMX system, but they also have IR or RF remotes available. This allows us to lower and raise the screen from several locations, giving the tech crew options when determining who needs to set up the baptism look. We can also install a local switch to the screen so we can manually control it directly on stage. A very nice feature is the design of the cabinet in which the unit is contained. This includes a locking lid that disables the motor controls when closed and locked – a great safety feature when we need to build a set piece on top of it, or when a musician decides to leave their instrument on the lid. The mica enclosure looks very nice if it was needed to be a stand-alone piece, but we surrounded ours with light boxes. The arms that control the screen and hold it up are incredibly well built and strong. Keep in mind, if you want a rear projection model, there will need to be enough black material on each side of the screen to hide the mechanisms. Also, this thing is a beast. Obviously, the size and weight depends on the screen dimensions you get, but ours is over 20’ long and weighs over 700 lbs. You’ll need a good sized crew just to get it on the stage. We are extremely happy with Vutec Vision’s RetractaVu product– both the performance of the unit, as well as the price (especially given the size of the screen). If you are in the market for a slick, well-built retractable screen, I highly recommend checking them out! Bryan Bailey is the Minister of Media at First Baptist Church Dallas in the heart of Downtown Dallas, Texas, where he leads a volunteer crew of over 35 people every Sunday to enhance the worship experience and deliver the Gospel to the world with excellence. Bryan lives in Murphy, TX with his wife, Jenni, son, Caden, chow-chow, Taylor, and a bunch of saltwater corals.